Two Ways to Improve Listening (and One Way Not To) - Dave Stuart Jr.
SLANT: Sit up, Lean forward, Ask and answer questions, Nod your head, and Track the speaker. I used to have a SLANT poster hanging up in my classroom, right next to the one for PVLEGS. I had learned of SLANT from Doug Lemov's Teach Like a Champion; PVLEGS came from Erik Palmer's Well Spoken. They seemed to make the perfect pair: SLANT makes students better listeners, and Palmer's PVLEGS makes students better deliverers of listening-worthy speech. Alas, the marriage couldn't last. So while I obviously can't fault the thousands of well-meaning teachers who use SLANT in their classrooms (after all, I used it, and I was well-meaning, and I certainly don't think any children were harmed in the process), I don’t use it with my students anymore. Instead, I recommend the following two strategies for those of us trying to help our students become better listeners. 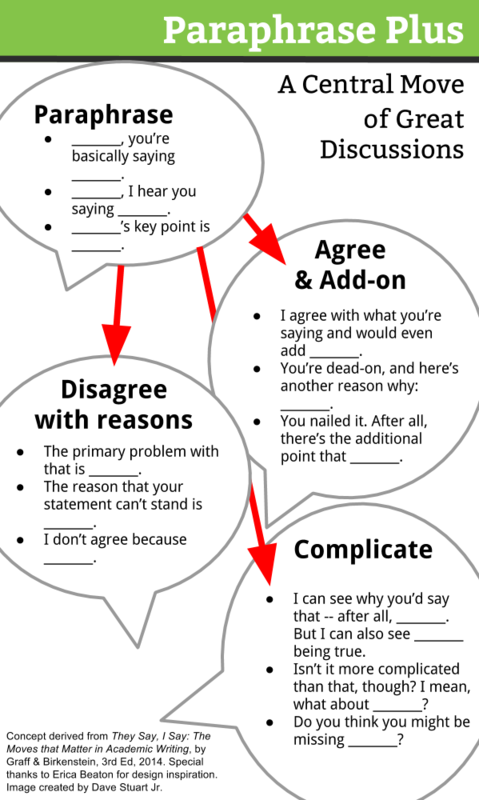 First, during small group “Conversation Challenges” or whole-class pop-up discussions or debates, we can require the use of Paraphrase Plus. (See Figure 1, and click it to enlarge.) This simple set of moves does much to decrease the incidence of “silo speeches,” those boredom-inducing fruits of debates or discussions with little connectivity and listening. The seminal treatise against silo-ized communication is Graff and Birkenstein's They Say, I Say. The “They Say” moves are essentially about listening and making that listening apparent. Second, we can teach, model, and require a different kind of “tracking” than SLANT refers to: note-taking. I've given a good overview of how I approach that (based on the sage guidance of Les Lynn at Argument-Centered Education) in this article. When students track a conversation like this, they can't fake listening because they've got to understand what a speaker has said and then shorten that understanding into something they can write down in their notes. Like always, no silver bullets here, but certainly some swords for slaying the non-listening dragons.